Curiously, the Nexus 6 features the exact same size battery as its main Android rival, Samsung Galaxy Note 4. Read on to find out how the newcomer’s battery performance stacks up against the Korean offering! Motorola Nexus 6 started off our test by posting a stellar 25 hours of talk time. This is one of the better results we’ve seen, but not quite as good as the 28 and a half hours of the Note 4. 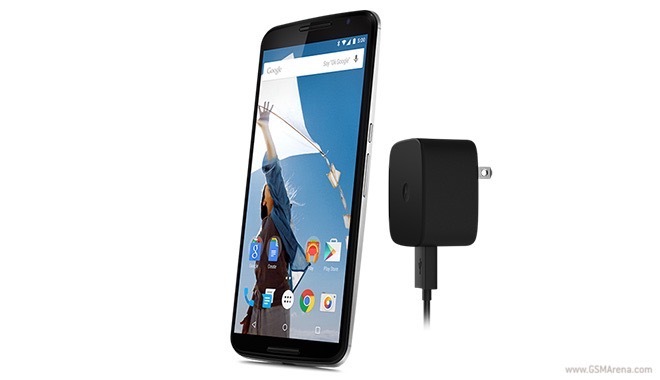 With close to eight hours of web browsing on a single charge, the Nexus 6 didn’t exactly set the arena on fire. The result is almost three hours short of the 10:44 outing of the Galaxy Note 4. Arguably the most taxing battery test area, the web browsing result of the Nexus 6 reveals that its 5.92” QHD AMOLED display doesn’t quite match the quality of its rival’s Super AMOLED unit. The video playback section of the test reveals a similar picture. Motorola Nexus 6 made it through 10 hours of continuous video, whereas the Samsung Galaxy Note 4 ran for 17 and a half hours. The Motorola phablet partially makes up for the shorter screen-on time with the presence of front-facing stereo speakers. The latter are a massive improvement over the single speaker found in the Note 4. 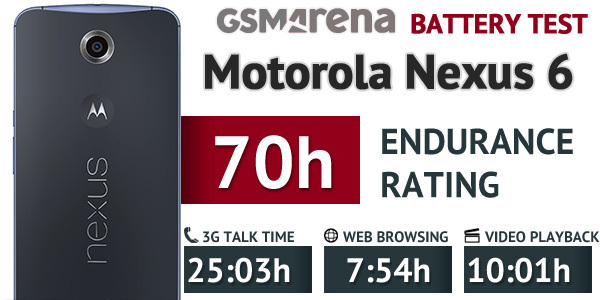 The overall endurance rating of the Motorola Nexus 6 is 70 hours. This means that the device will make it through almost three full days of usage if you opt for an hour each of telephony, web browsing, and video playback. The score of the Nexus phablet falls short of the 87-hour rating of the Samsung Galaxy Note 4 due to the inferior display, which proved to be quite an energy hog. However, the Nexus 6 easily makes it through a full day of heavy use, so it will certainly suit even discerning power users. The device’s Motorola Turbo Charger and Qi wireless charging support also make its battery easy to replenish.